The Cosmos Biomedical Receptor Destroying Enzyme (RDE) kit is produced to assist in the serodiagnosis of the influenza virus. Our Receptor Destroying Enzyme (RDE) Kit eliminates non-specific inhibitors in human serum during serodiagnosis using the HI test for influenza virus by the action of the Receptor Destroying Enzyme. Our RDE is isolated from Vibrio cholerae Ogawa 558 to give high quality and reliable results. Isolated from pure Vibrio cholerae Ogawa strain 558 culture. Each vial contains 2mg of kanamycin sulphate as a preservative to ensure longevity and reliability. Material Safety Data Sheet (MSDS) and other documentation freely available upon request. Elimination of the inhibitors in human serum during a serodiagnosis test (Hemagglutination test: HI test) of the influenza virus. 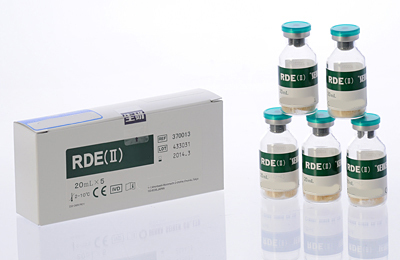 RDE is used in the HI test for the influzena virus in order to eliminate non-specific hemagglutination inhibitors existing in a serum specimen by using An RDE (Receptor Destroying Enzyme) produced from Vibrio cholerae serovar Ogawa strain 558. Final diagnosis should be made based on clinical symptoms, and the results of other assays. Do not use human serum with RDE for Serodiagnosis of the mumps or parainfluenza viruses since it may result in destruction of some of the antibodies contained in the serum. RDE should not be used for purposes other than the intended use described above. The RDE should be used immediately after it has been dissolved in the physiological saline. If the dissolved solution has to be used at a latter date, store by freezing at -20°C or lower. NOTE: the freeze/thaw procedure should only be performed once. All samples should be treated as potentially infectious, and should be handled with care, with all necessary precautions taken. Used containers should not be used for any purpose. Use a water bath in the heating process described in 'Test Procedures', and keep at a constant temperature of 56°C. When handling the product ALWAYS wear gloves, eye protection, and a mask. Avoid ingestion of the reagents. If the reagent comes into contact with the skin, or eyes flush with copious amounts of water. If in any doubt consult a physician. All specimens, used containers, and equipment used for the analysis should be treated accordingly to either methods (1) or (2) described below, and then disposed of according to the appropriate waste handling regulations. Soak in 0.5 w/v% sodium hypochlorite (effective chloride: 5,000ppm) for a minimum of 1 hour. Autoclave at 121°C for a minimum of 20 minutes. Completely dissolve the product in 20mL of sterile physiological saline. This solution should be used immediately. Under sterile conditions, add specimen and serum to the RDE solution in the ration of 1:3, and mix thoroughly. Then heat at 56°C for 30 to 60 minutes to deactivate the RDE. Use the treated serum (as stated in steps 1, 2 and 3) in the serodiagnosis test (HI test) for influenza virus. Use human serum without the HI antibody to influenza as the serum specimen. The seasonally selected influenza A and B virus antigens should be used for the HI test. Mix the serum specimen and RDE in a 1:3 ratio, and leave the mixture to stand at 37°C for 18 to 20 hours to complete the reaction, and then stop the RDE reaction by heating at 56°C for 30 to 60 minutes. Next remove the non-specific hemagglutination substances to chicken red blood cell by absorption. The HI test for influenza virus should be performed using the virus antigen described in clause 1 above. Confirm that every serum specimen has no hemagglutination inhibition activity. Store at 2°C to 10°C protected from light.